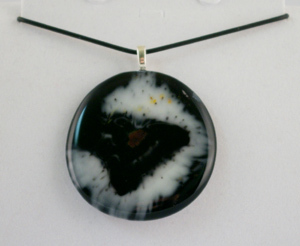 The circular black glass pendant is made of two layers of black glass cut into a circle . White and coloured crushed glass called frit is piled over small pieces of dichroic on the circles. The glass is melted at very high temperatures resulting in the ground glass to melt away from the middle. Each pendant is therefore completely unique.